Finally the snow is slowly disappearing. In sunny places it is all gone. However in the woods and where it is shady several inches of snow remains. Also there is still snow along the Banadad but not enough left to ski. 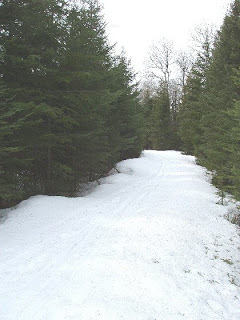 With morning temperatures in the low twenties it will be awhile before the few remaining snow patches in the woods leave us. As for the Lake ice, not even the small lakes such as Road and Swamper, which are among the first to open, have even started to lose their ice. I suspect it will be at least the second week in May before the ice is off most of the lakes and even then many of the larger lakes might still be cover with ice. So folks- look for a late fishing opener! According to WTIP radio , the Cook County Grand Jury has returned an indictment for Careless Driving and Failure to Drive with Due Care against 27-year-old Border Patrol Officer Maranda Marie Weber in the death of Dr. Kenneth Petersen on October 31st. The charge of Felony Criminal Vehicular Homicide was dropped. 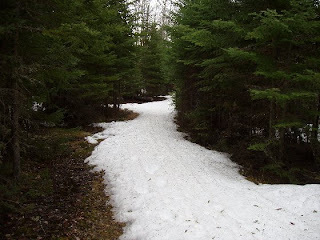 Snow along the Gunflint Trail is slowly melting away, In sunny areas the brown vegetation is completely exposed yet in the woods up to a foot of snow still remains. Most of the snow went when a heavy rain drenched the area on Monday night. This morning the temperature is hovering at 38 degrees but rain followed by snow is expected by tonight and into tomorrow. The lakes remain ice covered. The Poplar Creek at the foot bridge below the Poplar Creek Guesthouse is still well below flood stage. If the predicted rain and snow occurs, this bridge will likely be underwater. There still is six inches of snow on most of the Banadad and there are very few bare spots. However the trail is no longer being tracked. Morning temperatures this past week have been in the lower twenties; afternoons have warmed to the mid forties. Photo taken today at the eastern trail head. The snow cover on the trail should last for another week at least. For you die-hearts, who want to make your own tracks, the Banadad remains open for very good spring skiing. The Border Patrol will use space in the Coast Guard Station as well as its present building on Highway 61 instead of building a new facility in Grand Marais as originally planned. The General Services Administration canceled its solicitation for offers for building a new facility in Grand Marais on Monday, according to a GSA spokesperson. And Shelbe Benson, U.S. Border Patrol, Grand Forks Section Headquarters, wrote in an e-mail: "Border Patrol is not actively seeking a new facility at this time." Instead, it will use both buildings. The Border Patrol in International Falls has also moved into a satellite facility and will be retaining its primary facility, she said. Although, she added, “The Border Patrol is working on the logistics of a new facility for International Falls, and the logistics of the Duluth Border Patrol facility is still being worked out." If you are interested in the history of the Port Arthur, Duluth and Western Railroad, which ran from Port Arthur to the Paulson Mine, go to- http://members.shaw.ca/padwrr/. The railroad extension into the Minnesota was first to reach the iron ore at the Paulson Mine north of gunflint lake. When this venture met with failure, the Pigeon River Lumber Company constructed a side spur called the Gunflint & Lake Superior Railroad from Little Gunflint Lake, 3 and ½ miles to Crab Lake in 1903. For several years this logging venture succeeded in shipping a rich harvest of timber from the Crab Lake area onto the mills in Port Arthur. The website by Dave Battistel, Thunder Bay, Ontario traces the history of the rail road from it inception in 1872 through its demise in 1938 and then traces the disposition of the rail line's route and facilities up to 1999. The site also includes many historical and recent images of the rail line.